There are many reasons I attend a show. Sometimes it’s on a subscription. Others I hear the description, and they sound interesting (like next week’s This Land). I may have heard the music, and that makes me want to see the show. For a small number, I have a personal connection to someone in the production. In the case of Mice, which I saw Sunday evening at the Ensemble Studio Theatre LA (FB) in Atwater Village, I know the playwright. Schaeffer Nelson (FB), who wrote Mice, has a day job at a ticketing service, and he has been the person with whom I’ve been working the last two years to do our Saroya (the venue formerly known as the Valley Performing Arts Center (VPAC)) (FB) subscriptions. He has always been patient with me on the phone, working to get us the most shows for what we could afford, in the best seats, at prices we like. So when EST’s publicist sent me the announcement for Mice and I saw Schaeffer was the author — and it was indeed the Schaeffer I knew — I knew I would try to fit it in. This was despite the fact that it was about a subject that I normally wouldn’t go see — horror and murder. Mice is a seventy-minute one-act play about a sadistic cannibal in a mouse costume who kidnaps the wives of pastors, binds them in a dungeon, tortures them, and eats them. If you’ve read my reviews, you know that’s a play I wouldn’t see. Well, to be precise, I wouldn’t go to see it unless there was song and dance (cough “Silence, The Musical”, cough, “Evil Dead, the Musical“). When you are let into the theatre, you are confronted with the scene of two women, sitting on top of trash, chained by their hands and feet to two poles. As the show starts, the two start talking, with the one who had been held the longest, Ayushi (Sharmila Devar (FB)) attempting to calm the most recent capture, Grace (Heather Robinson (FB)). In doing so, she’s providing the necessary exposition for the show: why and how people are captured, what is done with them. She also encourages Grace to attempt to escape the next time their captor comes down to the basement for them. Shortly thereafter, we meet their abductor and capture, who is wearing a large mouse costume (Kevin Comartin (FB)). We soon learn why he has been capturing women, and why he has changed his mind about eating Grace. It is not, as you might think, that the suit told him to “Say Grace Before Eating”, which he heard as “Save”. Rather, the suit has told him that he needs to find a replacement, and both women smell right — so now he must decide. I’ll leave the plot hanging there. I’ll first note that, although I went in expecting not to like this show — as I’m not a big fan of such dramas — this one caught my attention. I found the story, umm, captivating, and I really had no idea where it would go. That’s good. From reading some reviews, there was a worry that it would be scary or sadistic, but I didn’t find that to be the case. Second, it was really interesting to see this on the heels of Bright Star. There is an interesting connection with and parallel to the two stories, and a similar suspension of disbelief is required for both shows. I won’t give more away in that area, but see both if you can, near each other. I will note that I wasn’t the only audience member to walk out noting the connection. There were a few sequences where the dialogue got into heavy Christianity discussions, which left me — as a Jewish audience member — wondering if I was missing something. So given that this was in an intimate space (and thus the script might be revised for future productions), I’d ask: What is there about this play that specifically requires both women to be familiar with Christianity? What might change if one of the women was a Rebbetzin (Rabbi’s wife), or a wife of an Imam, or the wife of the leader of an Eastern religion? How much Christian theory and practice must the audience know? There were also a few plot slips that left me puzzled. Why, for example, after Mouseman was knocked out the first time, didn’t the women just take his ether soaked cloth and knock him out completely? It probably could be answered easily, but wasn’t. You don’t want to leave the audience distracted by such questions. Other questions, however, remain. Why, for example, a mouse? Was it a reference to this being some sort of cat-and-mouse game? Was it a play on our thinking of rodents as dirty and nasty? Or was it just a costuming convenience. There should be a reason, and it somehow should be clear. And how to they do to the bathroom. People in plays never seem to have normal bodily functions. But I digress. Some reviews I have read saw this story as a battle of faith, playing off the fact that Ayushi had essentially given up on her faith, but Grace was still strongly faithful. That battle didn’t come across to me — but it could be my lack of familiarity (or care) about Christian tenets, nor could I tell the difference between Ayushi abandoning Christianity and going back to Hinduism. There were a few pointed comments about the hypocrisy of Christianity, but the focus was more on self-loathing. Although it seemed to be a given that the wives of pastors are filled with self-loathing, I fail to see how that would be. Is there a particular reason that would be the case? I certainly haven’t seen it from the spouses of Rabbis that I know. But overall, I found this an interesting play — as any discussion between two captors might be. I noted the actors before. All of the performances were strong. The production was directed by Roderick Menzies (FB), who kept the pace moving along, and helped bring out proper captive behavior in the actors. On the production side, the Amanda Knehans‘s scenic design was simple: four poles for the captors (two each), some trash, tables, chairs, and a basement. Simple works. Michael Mullen (FB)’s costume design supports this well — the women look like, well, women who were at church, and Mouseman’s costume is suitably mouselike and bloody. The sound design of David Boman (FB) is interesting. One wouldn’t expect a lot of sound design would be needed in a show like that, and one would be wrong. There were numerous sound effects, all of which worked well. Ellen Monocroussos (FB)’s lighting design worked well to establish the mood and suspense. Other production credits: Mike Mahaffey (FB) – Fight Coordinator; Priscilla Miranda (FB) – Stage Manager; Liz Ross (FB) – Producer; Christopher Reiling (FB) – Associate Producer. 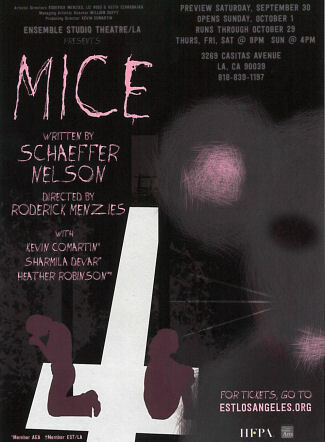 Mice continues at Ensemble Studio Theatre LA (FB) through October 29. Tickets are available through the EST LA Website. I was unable to find discount tickets on either Goldstar or LA Stage Tix, but small theatres like this can use the full price purchases. This show isn’t for everyone’s taste, but if you find the subject matter interesting — or attend the Saroya (the venue formerly known as the Valley Performing Arts Center (VPAC)) (FB) — it is worth seeing. EST-LA has another well reviewed production playing during October, Wet: A DACAmented Journey. I won’t be able to fit it in my schedule, but you might. This production’s Mouseman serves as the director. The theatre drought has ended, and the last three months of 2017 are busy busy busy. October concludes with This Land at Company of Angels (FB) in Boyle Heights. Looking into November, we start with the Nottingham Festival (FB) in Simi Valley, followed by The Man Who Came to Dinner at Actors Co-op (FB). The following weekend brings a Day Out with Thomas at Orange Empire Railway Museum (FB), as well as The Kingston Trio (FB) at the Kavli Theatre in Thousand Oaks (FB). The third weekend will bring Edges at the CSUN Theatre Department (FB) on Friday, the Tumbleweed Festival (FB) on Saturday, and Spamilton at the Kirk Douglas Theatre (FB) on Sunday. Thanksgiving Weekend will bring Something Rotten at the Ahmanson Theatre (FB) and hopefully Levi (a new Sherman Brothers musical – join the Indiegogo here) at LA Community College Camino Theatre (FB). November concludes with the Anat Cohen Tentet at the Saroya (the venue formerly known as the Valley Performing Arts Center (VPAC)) (FB).